Russians consider themselves as a country with two capital cities, and they have a point. While Moscow is the main capital city, Saint Petersburg is often referred to as Russia’s “northern capital,” and by design the Supreme Court and Constitutional Court of Russia are located in Saint Petersburg. Our feature of Saint Petersburg can be found here. Well, Moscow is a big city like many other big cities. It is the largest city in Europe with a population around 12 Million people. However like other big populations centres, Moscow is a magnet for illegal immigrants so the real population is greater. Moscow is a very beautiful city. Like any other city, parts of Moscow can be very ugly at times, too. Moscow is a very modern city. At the same time she is also incredibly old. 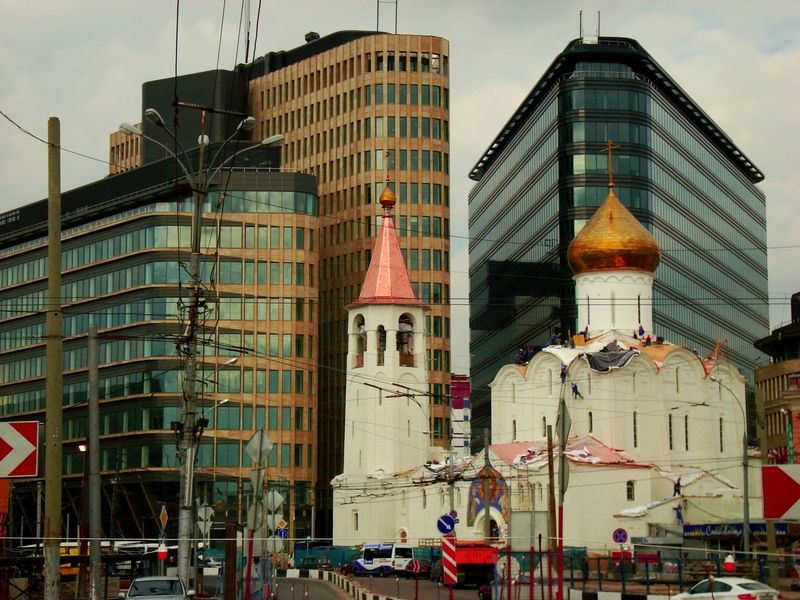 In fact, that is one of the things to like most about Moscow–the blend of new and old. The fact that you can stand next to a new skyscraper and enjoy the view of an 800 year old building across the street is thrilling. Take this scene for instance, the Saint Nicholas Church (1914, Old Believers) on Tverskaya Street, sandwiched in between modern office buildings. Now this is the essence of Moscow! 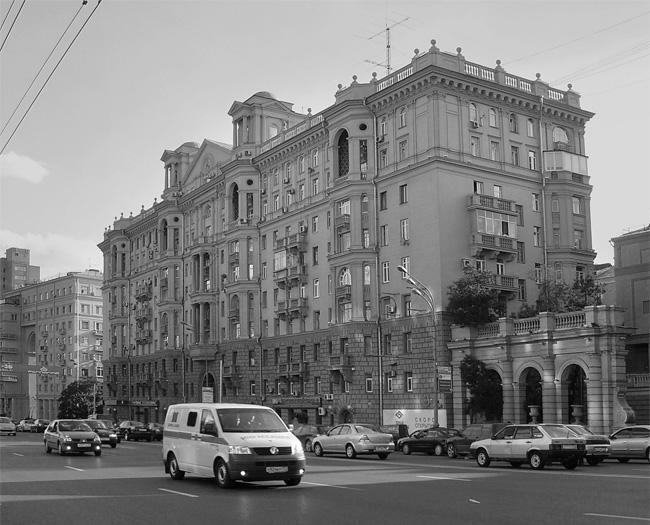 Moscow grew up during the Stalin years and continued to grow under Nikita Khrushchev but the two had dramatically different ideas about how buildings should be designed. Stalin, who played an active role in how buildings were designed, loved the classical styles of the day. Khrushchev on the other hand favoured minimalization and cost savings in order to speed up the process of construction. 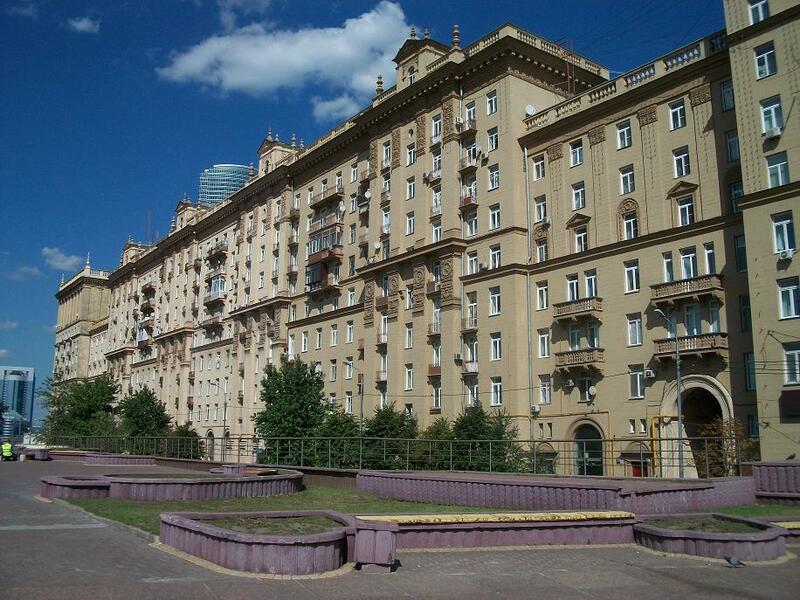 Large apartment house on Moscow’s Kutuzovskaya Avenue; Stalinist architecture. To Khrushchev’s thinking, Stalin had given in to excesses which were not part of the Communist ideal. Not only was Khrushchev faced with escalating Cold War budgets but the Soviet Union was far behind the West in adequate housing for its citizens and there was pressure on the government to increase housing stock at a rapid pace. In 1950, Khrushchev began a large-scale housing program for Moscow. A large part of the housing was in the form of five- or six-story apartment buildings, many still in use throughout the former Soviet Union. To speed construction Khrushchev ordered the use of prefabricated reinforced concrete to speed up construction.These structures were quickly, lacked elevators or balconies, and were called Khrushcheby by the public, a pun on trushcheby, the Russian word for slums. In earlier years Stalin had relied on inexpensive slave labour, German prisoners never returned after the war, for the construction of new Soviet housing. Many of the prisoners were skilled at complex architectural ornaments and decorative arcades and Stalin took full advantage of his “guests” abilities. Home of Soviet Air Force ace Chkalov, classical Stalin architecture. Photo by Алексей Борисов. Stalinist Gothic, or Socialist Classicism, is a term given to architecture of the Soviet Unionbetween 1933 and 1955. Many examples remain in Moscow and other cities today. Most of these structures were formed from brick masonry underneath the stucco facades or concrete block panel houses and larger skyscrapers. Many of the Stalin buildings were erected between 1939 and 1941 and then after the war with Germany. 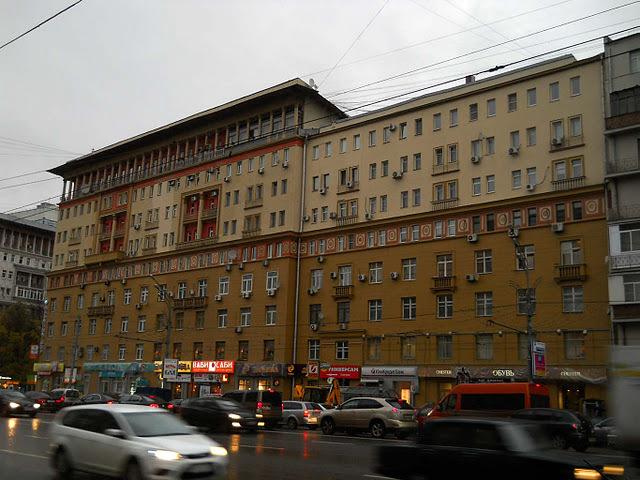 Stalinist architecture relied on labor-intensive and time-consuming craftsmanship, thus making it difficult to meet the needs of mass construction. This resulted in streamlining construction methods in the closing years while Stalin was still alive and then much more widespread after his death. The Krymsky Bridge (Crimean Bridge/Крымский мост) is the only steel suspension bridge in Moscow. Completed in 1938 under the reconstruction plans of Joseph Stalin, it spans the Moscow River and connects the Crimean Plaza with the Krymsky Val street. Krymsky Bridge, Moscow. Copyright: The Mendeleyev Journal. The address is Krymskiy Val Street & Frunzenskaya Naberezhnaya. Metro stations serving this immediate area are Park Kultury (across the street from the bridge), and Metro Oktyabrskaya. 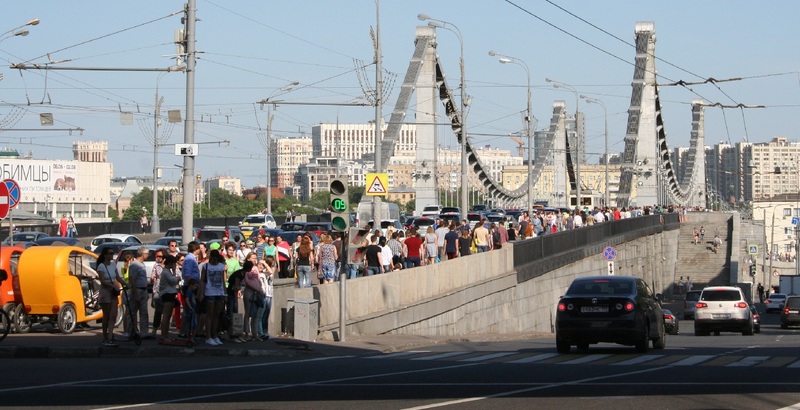 The location of the bridge, popular with pedestrians because of the views, is 1800 metres southwest of Red Square. The bridge has been featured on postage stamps twice: March 1939 and December 1948. The bridge’s length is 668 metres, 24 metres wide, and there are 6 lanes for traffic and two pedestrian lanes. 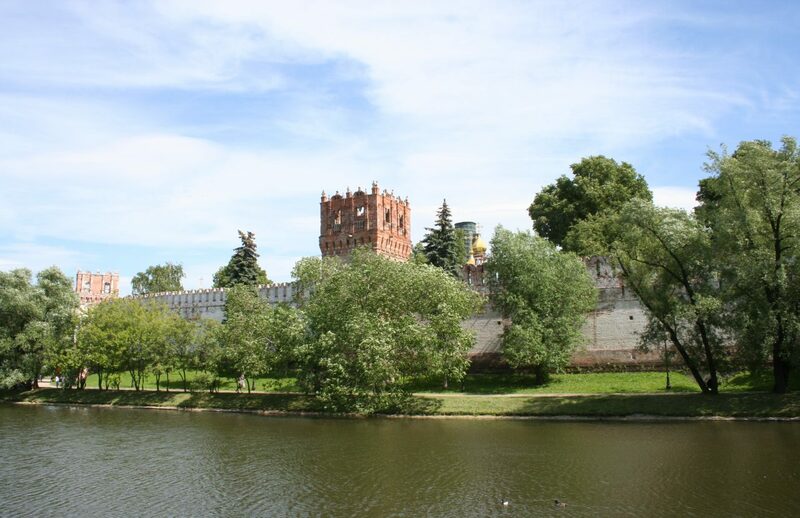 Nearby is the Kultury Park (Park of Culture), the State Tretyakov Gallery, the home museum of Leo Tolstoy, and the famous Church of Saint Nickolas at Khamovniki. 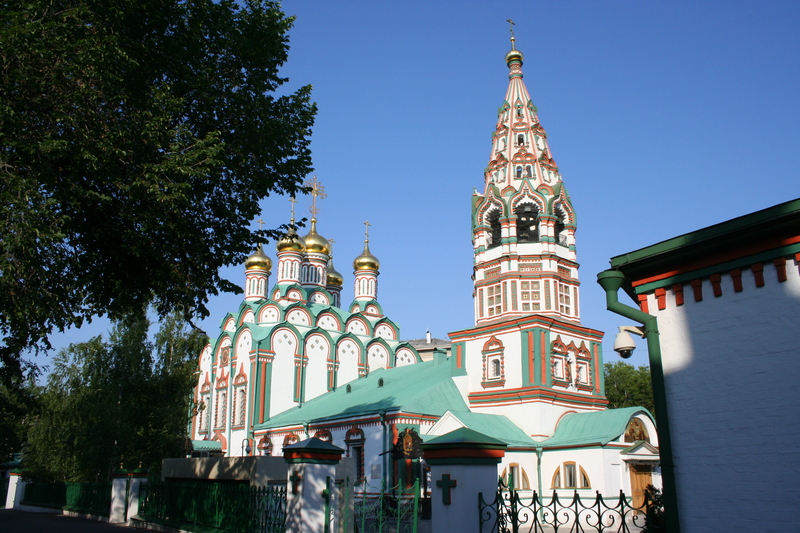 Church of Saint Nickolas at Khamovniki. Copyright: The Mendeleyev Journal.